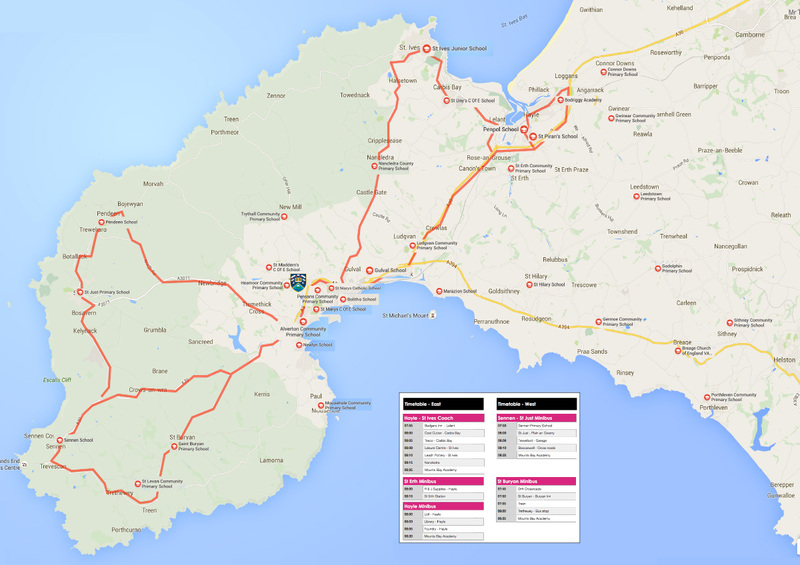 There are many ways to get to and from Mounts Bay Academy including our own Minibus Service. The Academy is situated in the village of Heamoor to the northwest of Penzance. A30 between Penzance and Lands End. Follow the signs to Heamoor from the A30. After approximately half a mile turn left into Boscathnoe Lane. The Academy is immediately on your left. First Kernow operates the following services for students directly to the Academy: 1, 5, 10, 16. Additionally the No. 2 service from Helston to Penzance along the A394 stops by Heamoor Store. For more details see the First Kernow website here. Pupils may qualify for free travel if the academy is their nearest school and moor than 3 miles from their home address. There are additional entitlements for children from families on low income. For more details see the Cornwall Council website here. For more details download the Academy Minibus Leaflet here. Trains operate on the West Coast Mainline arriving into Penzance railway station in time for morning registration. For more details see the GWR website here.